Virtual Assistant Tips to Increase Productivity and SAVE TIME! Learn how to be more productive by leveraging a virtual assistant team so you can focus on what really matters. FREE Virtual Assistant Guide: You'll get instant access to our Top 10 Virtual Assistant tasks and other business tips to save you time and money. Focused on Outsourcing: Over time, I'll get to learn about you and deliver content that actually matters to your business. No Hype: Just real content that is designed to improve your business, marketing, and sales efforts - (and save you time!). Resources: New stuff always comes out, and it's our job to keep you on top. Only dummies work hard, you work smart! Hi - I'm Jeff "J" Hunter, the founder of VA Staffer, and I'm blessed to work with some of the most talented, dedicated, and resourceful people on this Earth. Join us as we explore how to get things done - smarter. Your information is 100% private and will not be shared. Ever. What type of Virtual Assistant Tips? Oh man, there's so many things I can think of. Ironically, most of my ideas come from our clients and what they need. We really tackle the pain points of our clients and share ways to improve just about ANY type of business from our lessons learned. There are two types of people in this world, ones that have a lot of time, and those that don't. I have a feeling if you're reading this right now you could be either - but I have a hunch, you have too much to do and you're looking for some help. 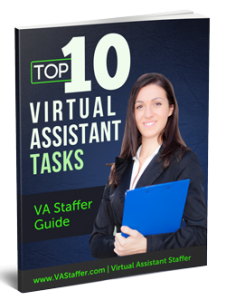 What is the Top 10 Virtual Assistant Tasks? It's a guide we put together with 10 common tasks our clients ask us to do to save them time. From lead generation, to social media management, to online research - and more! Nope. No joke - by subscribing, you're going to get the tips, and that's it. We don't do affiliate stuff, or try to sell you something. We simply tell you about something we learned, or share something that helps. Honestly, if you read all of this - if you're reading this right now, you are a very thorough person. How do I know this? Simple, years of our own digital marketing research show that less than 2% read this text. No joke, it's something I'd talk about in our Virtual Assistant Tips.